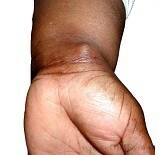 A ganglion cyst is a benign protrusion on the wrist joint filled with fluid from the joint. An X-ray and ultrasound are always used to exclude an underlying cause (fracture, inflammatory condition, ligament injury, etc.). No cause is usually found. The ganglion cyst does not really cause any pain but impedes the flexibility of the wrist and is aesthetically unattractive. The decision to operate is only taken if it causes considerable inconvenience. 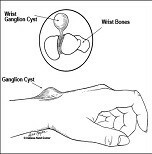 We always explain that a ganglion cyst may disappear of its own accord and may also return after being operated. We differentiate between two types of ganglion cysts: an upper dorsal ganglion cyst and a volar ganglion cyst on the underside, which commonly occurs near a major artery (radial artery). Treatment of a dorsal cyst involves an open excision or removal. 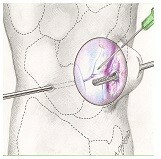 The cyst can also be easily removed via keyhole surgery (arthroscopy). This leaves smaller scars and flexibility of the wrist is regained more quickly after the procedure. The decision of whether to use an open or keyhole surgery technique is made by your surgeon. The same treatment methods apply to a volar ganglion cyst. Both procedures are followed by a two-week immobilisation period for the wrist using a compression bandage. A quick recovery is expected. The removed cyst is sent for anatomopathological examination and we also explain that this type of cyst may return.